Professor Sonya N. Martin of the Department of Earth Science Education at SNU has always placed passion over position. It was this that inspired her to leave her tenured position at Drexel University to continue her research and teaching in Korea, a country about which she had limited prior knowledge. Her motivation: to provide science education to learners of all backgrounds and abilities. After finishing her undergraduate degree in Biology at Bryn Mawr, a women’s liberal arts college, Professor Martin worked for three years as a researcher in a developmental biology lab at the Veterinary Hospital at the University of Pennsylvania. While there, she also took courses in gender studies and child development offered at the university. There she met a group of women who were all elementary education majors. Through these women and the courses, she learned there was a critical need for elementary teachers with strong STEM content background. Thus, she decided to pursue her Masters degree in Elementary Education, rather than continue in research science. For five years, Professor Martin taught science in Philadelphia public schools where she began doing research on how to improve science learning for racial minorities in poor urban schools. Steadfast in realizing her passion and talents, Professor Martin combined her two interests of improving students’ STEM content knowledge with equity focused research by pursuing the a second Masters degree in Chemistry Education from the University of Pennsylvania and, eventually, a doctoral degree in Science Education from Curtin University in Australia. As an Assistant Professor at Queens College, CUNY in New York and, later at Drexel University in Philadelphia, Professor Martin had the opportunity to meet and work with many recent Asian immigrants, an experience which expanded her interests to include science education for English learners and other minorities. She explored her research interests with her National Science Foundation (NSF) funded project, G-SPELL (Gender and Science Proficiency for English Language Learners), which emphasized collaborative teaching between science content and ESL teachers to promote effective science education for students who came from Asian cultures. Professor Martin eventually applied for international faculty positions in Asia to expand her research and to gain first-hand experience of immigrating to a new country. In 2011, she joined SNU’s Department of Science Education. Over the last six years, she has focused her efforts on research related to inequities in science learning that stem from gender inequality and the science learning challenges faced by students who are culturally and linguistically diverse or who have special education needs. Professor Martin’s thoughts on racial and gender equity in science education inspire her to reach out uniquely to her undergraduate (pre-service teachers), cross-culture, and disadvantaged students. Her methods and approaches extend beyond the classroom, where she often provides opportunities for her students to interact with teachers who impact the lives of real students of all backgrounds. This hands-on approach helps students broaden their perspectives of the field of science education. “The civil service system in Korea has affected the way people view the position of a teacher. Students may sometimes seek the position of being a teacher rather than becoming a teacher for the passion and work needed to educate all students.” Alongside training students in methodology and theory, then, Professor Martin believes in fostering the passion for teaching. 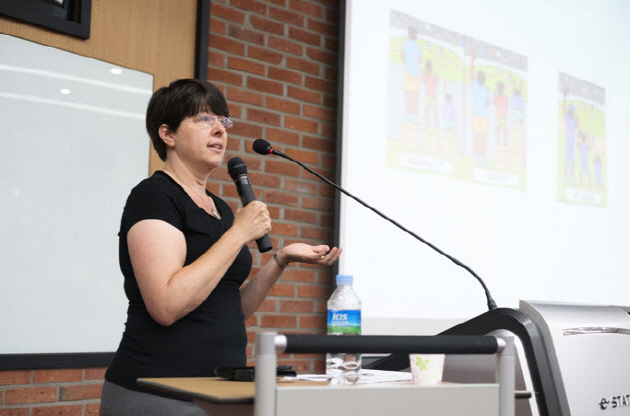 Professor Martin continues her efforts to inspire her students and constantly works on new projects to develop the teaching of cross-culture and disadvantaged learners across Korea. One of the latest events was the Science Fair for All Students, which was a culminating activity in a course Professor Martin created for pre-service teachers called, “Teaching Science for Diverse Learners.” In this course, Professor Martin and students from her course partner with students and teachers from a local school for deaf and hard-of-hearing students to develop science activities for a full-day Science Fair held at SNU. The goal of the course is to support pre-service teachers to learn how to effectively teach science to diverse learners. This fall, the class will be offered for the third time and will be co-taught by Professor Martin and one of her graduate students. Professor Martin is currently working on two projects. The first is a project focused on examining accessibility issues in informal science learning contexts, such as science museums, for people with disabilities. The second project focuses on developing materials for a Korean as a Second Language (KSL) teacher education program that can be used to educate and support teachers who will teach science to cross-culture students in K-12 public schools. 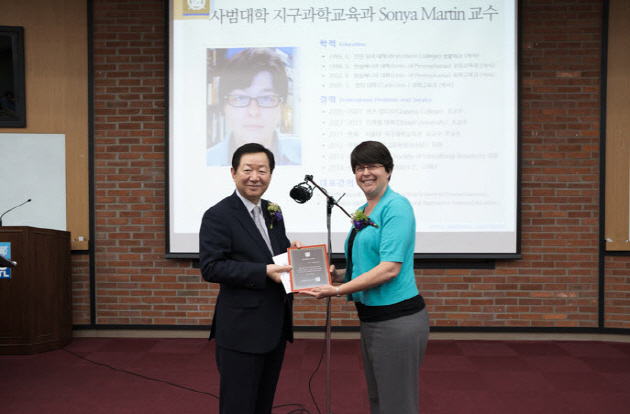 It has been nearly 6 years since she has become a part of the SNU staff and, grateful for where her passion has brought her, Professor Martin plans to remain in Korea indefinitely.